Our family honors Pancake Saturday. My older son has even created a song and dance to celebrate it. With a little extra time on the weekends to prepare and enjoy breakfast, and because we're all in need of a sweet treat at the end of the week, pancakes are perfect. This is also a great dish for kid kitchen assistants. 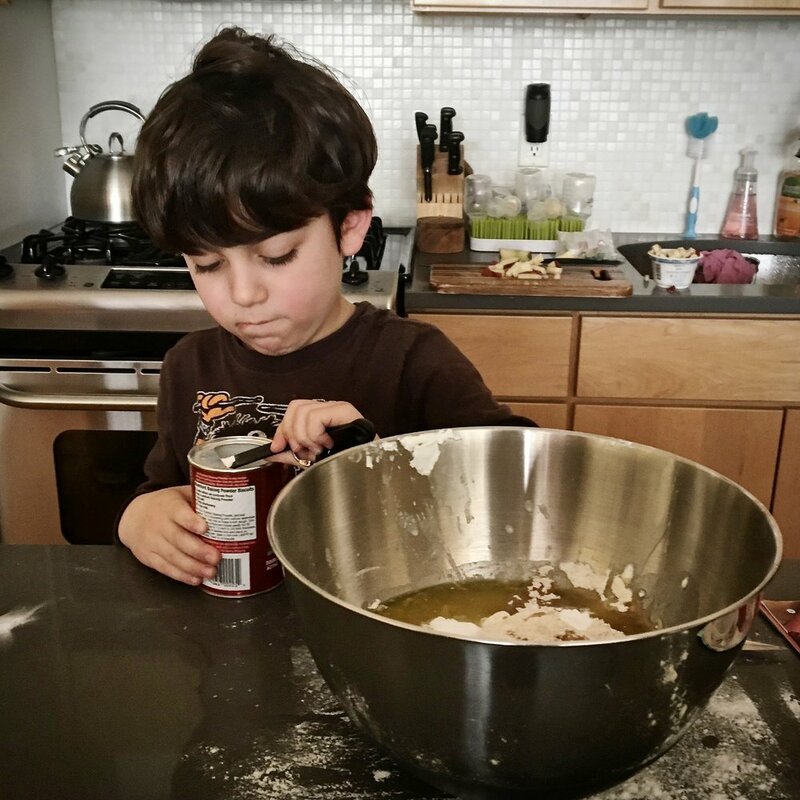 My little helper measures ingredients, cracks eggs, and mixes, while repeating the mantra "we never over mix the batter." Don't over mix your pancake batter. To save yourself even a little bit of time and a lot of mess when making weekly pancakes, mix your dry ingredients (flours, sugar, baking powder, baking soda, salt) in a large batch and store in the pantry. If you are like me and use multiple flours (I like a blend of whole wheat all purpose, white AP and cornmeal for most of my pancakes), this will allow you to just take one canister out of the pantry instead of 3 or 4! Now you have absolutely no reason to buy that packaged stuff. PLEASE don't buy that packaged stuff anymore. We make a variety of pancakes but a favorite go to for their classic Italian origin and to help fatten up our skinny baby is Lemon Ricotta. While visiting my sister last week, I was inspired to make these after cleaning out her fridge and finding a pound of ricotta cheese and fresh local Florida blueberries. In return, she documented the finished stack you see above. It's nice to have a professional photographer for a sister. These lemon ricotta pancakes are fluffy and creamy all at once. I adapted the recipe from a few sources, but mostly from Cooking Classy. 1. Whisk together the flours, sugar, baking powder, baking soda, salt. Or if you have premixed your dry ingredients, measure out 1 3/4 cups dry ingredients and add to a large bowl. 2. Melt the butter. [tip: if you’ll be using a skillet to bake the pancakes, heat the skillet and melt butter in there to save yourself a dish to wash and to grease the pan). 3. In a medium bowl, whisk together the melted butter, eggs, ricotta, lemon zest and lemon juice. It may curdle a little bit, but that is okay. You also do not need to break up all pieces of ricotta. It's nice to bite into that creaminess in the pancakes. 4. Make a well in the dry ingredients and pour in the wet ingredients. Stir a few times with a spatula just to combine. Do not over mix. Fold in the milk and blueberries just until combined. 5. Reheat the skillet over medium high heat. Brush with more butter if needed. Drop 1/3 cup of batter onto the hot pan and top with additional blueberries if desired. Flip after 2-3 minutes or when you see bubbles on top and edges are lightly browned. Cook another 2-3 minutes.